1. Start by making the custard. Heat the cream, milk, and syrup in a pan over low/medium heat and allow to come to a gentle boil. Meanwhile, whisk the egg yolks with the sugar in a bowl, mix well until light, creamy and pale in colour. Once the cream mix has come to a boil, remove from the heat and whisk half of it with the egg mixture, in order to temper the eggs. Add the egg mixture into the pan with the rest of the cream and milk and place over low heat and stir continuously for 3 minutes. Remove from the heat and pass through a fine sieve. Allow to cool completely using an iced water bath. 2. Meanwhile, place the rum in a small pan over medium heat and allow to come to a quick simmer, remove from the heat and add the currants. Allow to stand for 1 hour. 3. Preheat the oven to 140°C, gas mark 1. 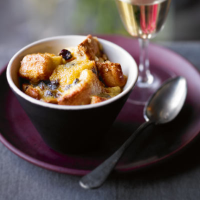 Cut the hot cross bun into large cubes and add to a bowl with 175g of the cool custard, soaked currants (discarding the rum) and mix being careful not to break the pieces of bun too much. Allow to stand until the bun has soaked up all of the custard. Split the mixture into 2 x 250ml ramekins, sprinkle some demerara sugar on top and place in the preheated oven for 25 minutes. As an option, once the puddings come out of the oven, using a blow torch, quickly caramelise the top.